It’s a hard argument to make the winter in Blighty is the favourite season but there is something to be said for hot chocolate (or a hot todddy) being acceptable at any time of day, and napping having become a welcome part of your Sunday routine (as opposed to, you know, drinking your face off on the day of rest because the sun’s out and you kind of feel obligated). Luckily,you don’t need to be any more pricey or creative than your average summer picnic in a park but they can be a lot more creative when you have winter dates. Between the pop-ups, crisp walks and indoor workshops, there’s more than enough romantic merriment to go around. Here are the best winter date ideas – because in these temperatures, everyone should have an excuse for a cuddle. From the concept of hygge everywhere you look to Scandi cafes cropping up around the city, there’s no end in sight to the surge of popularity and demand for anything Nordic-themed here in the UK. And it couldn’t be more perfect for getting cosy. 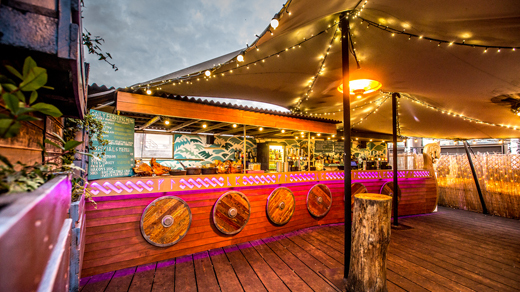 You could spend an afternoon inhaling meatballs and kannelbullar (the Swedish version of cinammon buns) at Scandinavian Kitchen in Fitzrovia or check out Shoreditch’s Nordic Yulefest, a magical world of all things Scandi (cocktails, food, DJs and Norse entertainers during the evening sessions, and Nordic brunching on Sundays). Lastly, head to Queen of Hoxton’s Winter Rooftop Skye Halla, featuring a Viking long boat bar, fire pits, driftwood sculptures, faux fur throws, drinking horns, and cocktails aptly called names like Blood of Loki (whisky, port, lemon juice, thyme and ginger, egg white and rosemary reduction) and Thor’s Courage (a hot mead punch with honey, ginger, rosemary and vodka). Speaking of boozy punch, switch up your average pub night out for one starring the fruity tipple. Nothing quite says ‘winter’ like a warm cup of mulled wine, with cosy scents of cinnamon, clove and orange. A crisp walk from one pub to another in the cold will take care of any lingering booze coma, and there’ll be no beer gut guilt. Even better? Set up a mulled wine taste test at home. Some of our favourites include Marks & Spencer Red Mulled Wine £5.00, Tesco Mulled Wine £3.50, Sainsbury’s Taste The Difference Mulled Wine £4.25, and Iceland Winter Warmer Mulled Wine £3.49. ‘Tis the season of hitting the slopes. But if you can’t get out of town quick enough, there’s always an apres ski pop-up to tide you over. This year Finsbury Square will be transformed into an ice cool Alpine wonderland, with log cabins and fires for warmth over dinner. You can watch dancers and acrobats perform from the roof tops whilst chefs carve prosciutto from the bars, and rich fondue and steaming glue vine is served from market stalls. There’s even an ice cave to continue the party if you’re so inclined. Speaking of structures carved out of ice, head to Mayfair’s Ice Bar for your 40-minute slot inside the UK’s only cocktail bar to be permanently frozen solid and maintained at a crisp -5°C. There’s no half measures here; all walls, bars, tables and even your own personal glasses are skilfully sculpted using ice from the glistening waterways of the Torne River in Jukkasjarvi, Sweden. This year the Basement features the Moose Room (restaurant) and Reindeer Lounge which are well equipped to host dinners, drinks receptions, cabaret and cocktail classes. And, of course, you already know about Kensington’s Bodo’s Schloss, known for its kitsch Austrian Alpine-style restaurant and costumed staff, plus their delicious rum punch served in a sharing ski boot. With a little imagination, it’ll transport you straight to the alps. You’ll be shocked at how much you can do at a craft workshop. And after taking up Queen of Hoxton’s offerings (making Viking jewellery, etching artwork inspired by Viking iconography or life drawing) you’ll also be primed for a night out in the surrounding Shoreditch area, so don’t think for a second it’s not “cool”. There’s no way you’ll be able to use the Netflix and chill date card when you could be drawing a Norse female warrior.